This blog is brought you by Kingsford Pellets, which provided advertising support. Using Kingsford Smoker Pellets in your pellet grill adds a smokehouse depth of flavor to any meat or vegetable. Kingsford has brought their 90 years of grilling tradition to a new endeavor: smoker pellets. The pellets are made of 100% natural hardwood, with no added filler woods or artificial flavor oils. By using 100% hardwood, you get a longer cooking time and have less ash to clean up in your grill. Here at EnviroTech Services, we have used over 100 pounds of Kingsford Premium Wood Pellets in our grills, and have found a depth of flavor that we have only experienced in the top smokehouse restaurants. The 100% hardwood creates a smoke profile that clings to the meat and forms the well-known smoke ring that everyone wants and loves. This flavor also permeates the meat and gives a great smoky flavor throughout. There are five types of flavor woods to choose from that are sure to take your pellet smoker grilling experience to the next level. Choose from 100% Cherry, 100% Apple, 100% Hickory, 100% Oak or if you are unsure grab a bag of the Competition Blend—all of which will deliver true smokehouse flavor to any of your meats or vegetables. If you’re wondering which pellets to use with your next meal, check out the handy chart on KingsfordPellets.com. The next time you grill steaks in your pellet grill, for example, try using Kingsford 100% Hickory Pellets. The best way to get that smokehouse flavor is to smoke them for at least an hour on the smoke setting, then bring the temperature up to 350 degrees, and finish cooking to your liking. 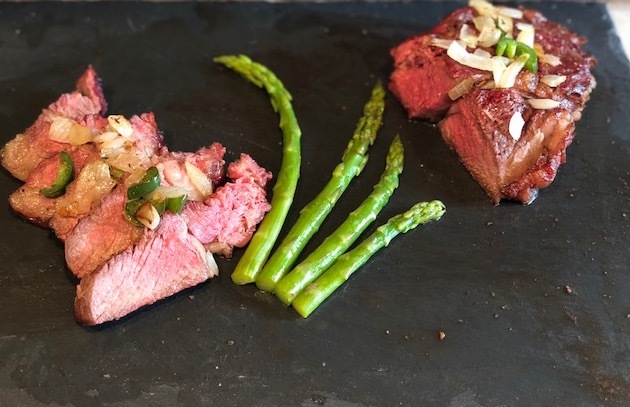 You will only need to season your steaks with salt and pepper, as the 100% natural hardwood will flavor the steaks with a depth of Hickory smoke flavor throughout. No need for special seasoning or marinades to have a great tasting steak! Check out KingsfordPellets.com to find out more about the new pellets as well as where you can buy them. For more on pellet grills, read BarbecueBible.com’s Guide to Pellet Grills here.